Those aluminum rain gutters have seen better days and are now starting to sag. The rust doesn’t help and leaks are causing the gravel to erode. Your investment needs to be in good shape for it to work properly. However, you might need to replace it if it is too far gone. Even missing or damaged downspouts can cause you to pay thousands of dollars in damages. Let the professionals at San Antonio Rain Gutter Pros do the job for you. You don’t even have to buy the hardware yourself. We offer complete rain gutter replacement and installation services. Contact us for a free consultation. We work closely with each client to determine their needs. This allows us to provide highly personalized solutions that fit their requirements the best. Why Replace Your Rain Gutters? Rust is dangerous and rusty metal spikes are even more so. You don’t want to scrape your skin on them the next time you need to retrieve that Frisbee. Our professionals will extract your old system and install a new one safely. We are a fully insured and licensed service. Do your rain gutters keep leaking from the corners? They might be rusted beyond repair. If they are not hanging level, it might be time to replace them. Contact San Antonio Rain Gutter Pros. 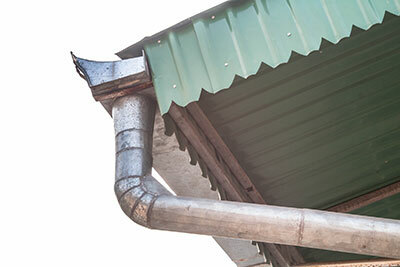 We will recommend a gutter system that resists rust and is sturdy enough. Your gravel, foundation and landscaping will be dry during thunderstorms. You just purchased a property. Unfortunately, the previous owners did not maintain it. Runoff has caused mildew to grow on the walls. It has also caused water to pool on the foundation, seep into your home and cost you thousands to repair the damage. Let us replace your old gutter system with a new model and see the value of your property soar. Are your rain gutters pulling away from your residential or commercial property? You don’t need a ladder to see the damage. Gutters that are always filled with standing water or debris tend to cave and sag. This can cause drainage problems and might not be appropriate for your home. The only way to improve the look of your building is to replace old gutters with new ones.